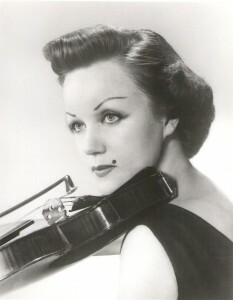 The violin soloist Evi Liivak of Estonia acquired the Lipiński in early 1962. At that time, and for over thirty years still to come, she lived in New York City with her husband, Richard Anschuetz, who was a concert pianist and her accompanist. The road from Estonia to the US had been a complicated and difficult one. Miss Liivak was born in Viljandi, Estonia in 1924 to Henn and Johanna Liivak. Her father was a lawyer, a music lover, and an accomplished violinist. Before his daughter was five years old, she had developed a keen interest in the violin from watching her older brother practice, and was at last given a violin. She took it up with great enthusiasm—eventually, the story went, causing her brother to decide to become an artist instead of a violinist. She was soon celebrated as a child prodigy, gave her first recital at six, and entered the Tallinn Conservatory at nine, receiving her general education through private tutoring. At the age of eleven, Miss Liivak played the Mendelssohn Violin Concerto with the Helsinki Symphony, and at twelve she performed the Tchaikovsky Violin Concerto with the Tallinn Symphony. At thirteen she participated in the Estonian delegation to the first Queen Elizabeth International Music Competition in Brussels (1937), where 29 year old David Oistrakh came first. 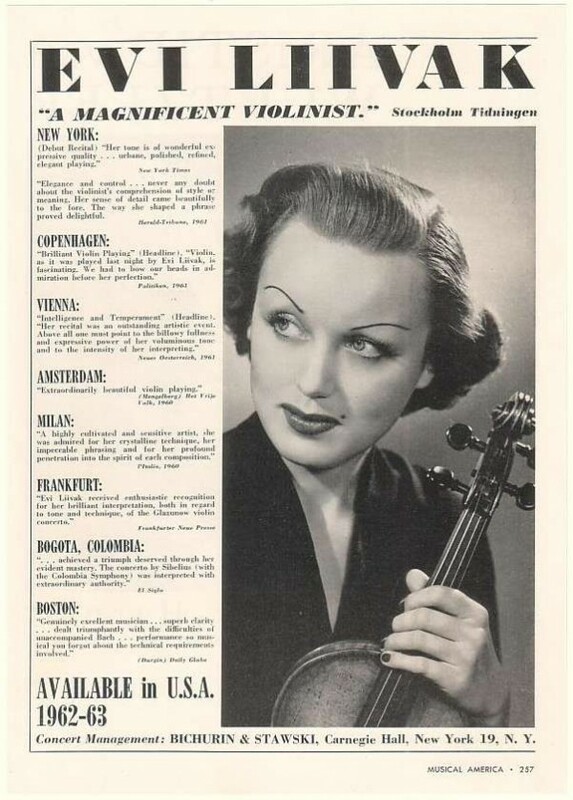 Upon her graduation from the Conservatory at fifteen, in 1939, in honor of her talent and hard work the president of Estonia presented her with a Maggini violin and a government scholarship to the Imperial State Academy of Music in Budapest. Her studies in Hungary with Professor Ede Zathureczky during the following two years were made very difficult by the war and the Soviet occupation of Estonia, which was soon followed by the German occupation and finally the Soviet annexation. She was recalled to Estonia, and soon her father, an Estonian patriot, was killed by the Gestapo. 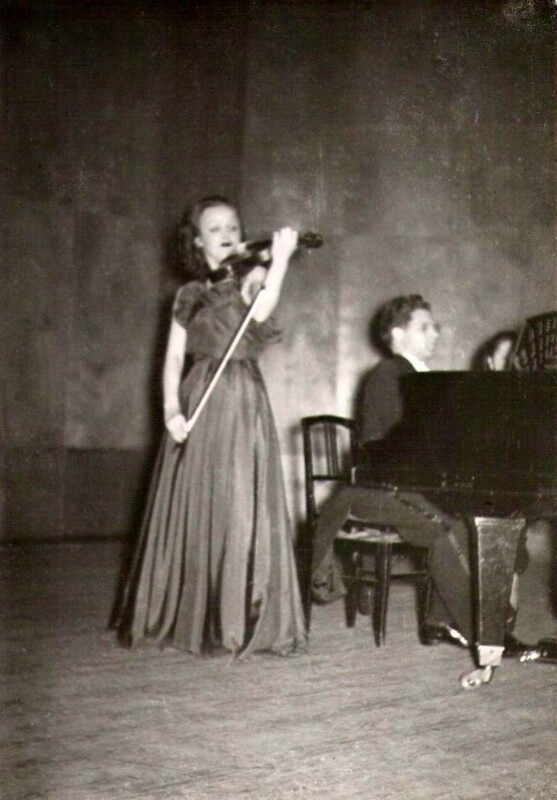 From then on, Miss Liivak was under their surveillance and life in Estonia became even more difficult as she continued to refuse to play music for the German officers. In order to return to Hungary and complete her studies, she was forced to go to Berlin to obtain the necessary papers. As an occupied country, Estonia had no foreign representatives any longer. In Berlin she was refused the currency which had been part of her scholarship, so could not return to Hungary. Due to the occupation of Estonia, Miss Liivak thus found herself effectively without a country and was obliged to remain in Germany. Already in Berlin and with funds low and her father dead, she entered the State Academy of Music in Berlin. There she finished her master’s degree in less than a year, studying with Professor Max Strub. When the Allied bombers struck Berlin a few months later, in early 1944, the building she lived in was destroyed. She discovered this upon returning home that freezing night after giving a private, and undoubtedly secret, recital to cheer up Estonian refugees. The recital had been interrupted by the air raid and they had gone to the basement with candles, where she finished the program. All her possessions were lost in the rubble except for an oil painting of her as a child holding her violin, which had been rolled up in a stout tube. She went to live in Marienwerder, just 35 miles north of Berlin, at the invitation of a fellow student. A few months later she was evacuated to Bad Landeck, a village in Silesia near the Czech border. In what she described as a lucky moment in her life, Prof. Strub had also been evacuated to Bad Landeck and she was able to continue her studies. After about six months, the advances of the Russian army caused her to return to Berlin for safety in late 1944. Within two months, she again had to flee the advancing army and went to Fürth, which is adjacent to Nuremberg in Bavaria. There she and her mother, who had remained with her during the wartime odyssey, stayed for over three years. Once in Fürth and with the war over, she quickly resumed her career. Although without a passport she couldn’t seek work in other countries, she gave recitals and made symphonic appearances in many German cities. She appeared as soloist with the Munich Philharmonic, the Frankfurt Museum Orchestra, and the symphonies of Mannheim, Dusseldorf, Wiesbaden, Nuremberg, Kassel, Solingen, Saarbrücken, and Fürth, and with the Radio Frankfurt Orchestra. The original recordings of the Frankfurt radio performances still exist. She performed under the direction of Rolf Agop and Hans Rosbaud, among others. She also did her part by performing in refugee camps and for the Allied troops. During that intense period of the mid 1940s she met Mr. Anschuetz, an American pianist who had been unable to leave Europe during the war and had remained in France, where he was interned for a time after the German invasion. He was originally from St. Louis, where his father had been a well-known choral director and his mother very active musically as a teacher of violin. He had deep Milwaukee roots on his mother’s side, having spent every summer there with his grandparents. He was at that time in Nuremberg working for the US Army as a translator at the War Crimes Trials. He began to accompany her in recitals occasionally as his work schedule allowed. Their first appearance together was in 1946 in Nuremberg. When the Trials were over, he returned to Paris and was able to cut through enough red tape to allow her to move to Paris in 1948. There she studied for three years with Professor Jules Boucherit, who also taught Ginette Neveu. His opinion of Miss Liivak was so high that he didn’t ask for remuneration. During this time she performed in Sweden, the Netherlands, Italy, and France. Miss Liivak and Mr. Anschuetz were married in Paris, and moved to the US in 1952. They settled in New York City. Her first major professional appearance in the US was at Town Hall in January, 1954 accompanied by Arthur Balsam. The New York Times said “Her tone is of wonderful, expressive quality. It is urbane, polished, refined, elegant playing.” Among other works that evening, she gave what was most likely only the second performance in the US of Jean Rivier’s Violin Concerto, having previously given the work its Canadian premier in Montreal. She had developed her interpretation of the piece by working in Paris with Rivier himself at the piano. She loved and played the Lipiński for 30 years of world travels. And at last, in retirement in the 1990s, she was able to visit the country that had been missing from all those itineraries. She had been only fifteen when she left home to study in Budapest. Her nation had been glowingly supportive in its estimation of her musical abilities. Then Estonia disappeared behind the Iron Curtain and its people no longer had the opportunity to know her. She would surely and deservedly have become a figure of national prominence. Instead, she gave her art to the world with complete dedication. In 1996, an Estonian film director planned a documentary to honor her and to try to remedy the deficit. Sadly, that was the year Miss Liivak passed away. The documentary by Airi Kasera, Armastuse Poeem (Poeme d’Amour), was filmed in New York with the participation of her husband and released in 1998. It includes the only known video of her performing in concert. There are some audio recordings of performances, and the couple made others in their home studio as part of their search for musical perfection. Mr. Anschuetz missed her dearly, and continued to do so until his death in 2008. He could not bear to be parted from her beloved violin, and treasured it to the end.